I just love it when I can eat food that not only tastes delicious, but is also nutritious and healthy. That’s how I would describe avocado. It is a superfood, but unlike some other superfoods that are hard to consume unless disguised as something else, avocado is yummy and can be prepared in so many different ways. Carotenoids are natural plant pigments. They are very powerful antioxidants and some types can be turned into vitamin A, which is essential for the health of your eyes. Carotenoids are soluble in fat, so they need a fatty environment to be absorbed. If you eat a fat-rich avocado together with other fruits and vegetables that contain carotenoids, the body will be able to use these antioxidant better. Adding a few slices of avocado to your salad should do the trick. You can learn more about antioxidants in my previous article about 9 amazing antioxidants for great health. This fact might come as a bit of a surprise, considering the fruit’s caloric value (half a medium-sized avocado contains 138 calories). However, because avocado makes you feel full, you actually tend to eat less. Also, avocado contains oleic acid, which activates part of the brain responsible for feeling full. What’s more, recent research shows that eating healthy unsaturated fats can help with your dieting efforts. You can also find here the best foods that help fight belly fat. Since avocados are an excellent source of healthy fats, they boost your good cholesterol levels – the high density lipoprotein or HDL cholesterol. For HDL, higher numbers are always welcomed. HDL prevents heart disease and stroke. So if you have a family history of heart attack, make sure that you stock some avocados in your kitchen. Just as avocados increase HDL or ‘good cholesterol’, they reduce LDL or ‘bad cholesterol’. The oleic acid helps reduce your overall cholesterol levels, and particularly the damaging LDL cholesterol, which is blamed for cardiovascular disease. If you are battling with high cholesterol levels, avocado might be your perfect savior. Find here more simple and effective ways to reduce cholesterol. This one is particularly interesting for pregnant women, who need to take folic acid supplements during their pregnancy. It turns out avocado is very rich in folate – a vitamin which prevents birth defects. One cup of avocado contains a quarter of your daily recommended intake. Folic acid is important for the health of your cells, as it prevents cell changes that could lead to cancer, so everyone should consume enough of it. If you’re worried about the pesticides in your food, you’ll be happy to hear that due to their thick skin, avocados are very resistant to pesticide contamination. Also, bugs don’t attack them so much, so fewer pesticides are used in the first place. And indeed avocados were on the top of the list of fruits and veggies with the least pesticides for 2018. So who said that having thick skin is a bad thing? Avocados contain plenty of phytonutrients. These increase the amount of antioxidants in your body which fight free radicals, which have the potential to cause damage to cells, including damage that may lead to cancer. Avocados may inhibit oral cancer and prostate cancer, as well as some other malignant diseases. Find here more foods that protect against cancer development. Did you know that avocados contain more potassium than bananas? They are also rich in vitamin K, vitamin B5 and vitamin B6. They hide a substantial amount of vitamin C inside their rich meat. Vitamin C is an antioxidant and it’s important for the upkeep of your immune system. Consuming enough fibers is essential for your gut and overall health. With avocado, constipation can become a worry of the past. Dietary fibers also help reduce cholesterol and blood sugar levels. The good news is that one avocado contains almost half of your daily recommended intake of fiber. I saved my favorite avocado healthiness for the end. Who would think that eating guacamole can improve your brain function? Well, according to research, avocados are up there with blueberries in promoting brain health. They contribute to healthy blood flow and reduce blood pressure, so your brain gets nourished without any interruptions. High blood pressure is often associates with cognitive decline, so keeping it within normal values will keep your little grey cells in optimal shape for old age. You can find here more ways to improve your brain function naturally. Avocado helps to prevent inflammation in the body, especially problems involving arthritis, due to several factors. 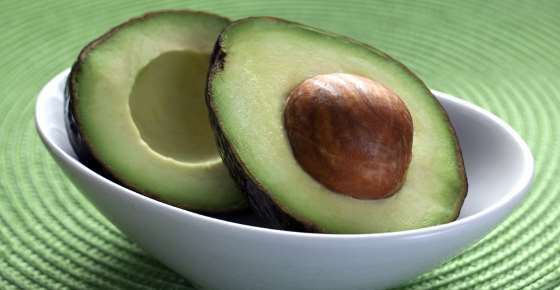 It contains phytosterols that are a major portion of avocado fats. These phytosterols are important supporters of our inflammatory system that help keep inflammation under control. Also its high content of carotenoids, as well as other nutrients, is a key factor in the anti-inflammatory properties of this fruit. Find here more foods to reduce inflammation in your body. While avocados are delicious fruits with a wealth of health benefits, many people ignore its seed. Avocado seed has surprising health benefits and it may contain the key to combating a type of cancer called acute myeloid leukemia (AML). Acute myeloid leukemia (AML) is a form of cancer that affects the bone marrow, and it is the type of cancer that may be aided by consumption of avocado pits. AML causes cells in the bone marrow to stagnate before ever reaching maturity, which leads to an excess of a certain cell type—called myeloid cells—in the bone marrow. AML causes bone marrow cells to malfunction, which creates an influx of non-mature myeloid cells to crowd the bloodstream, leading to leukemia cancer. As an acute form of cancer, it can spread and grow rapidly and infiltrate blood, the lymphatic system, internal organs and reproductive organs if not treated in time. Risk factors for AML include male gender, age 65 and older, chemical exposure, cigarette smoking, prior history of cancer, and prior exposure to radiation. Symptoms can include difficulty breathing, bone and joint pain, bleeding disorders, frequent infections and fatigue. A recent study published in the April 2015 issue of the Cancer Research journal had an astonishing outcome: a compound contained within the pit of the avocado fruit showed anti-cancer properties against AML. A group of scientists comprised of researchers from the University of Waterloo and Mount Sinai Hospital in Canada and the University of Perugia in Italy teamed up to explore the effects of several different previously untested compounds on the growth and spread of cancer cells. They administered several hundred natural health remedies to acute myeloid leukemia cells in vitro to see if any of the remedies were truly as effective against cancer as some of their proponents claimed. The results of the study were amazing. A compound in the avocado pit, called avocatin B, was found to be incredibly effective against AML cancer cells when compared with the myriad other compounds tested in the study. The researchers then injected acute myeloid cells exposed to avocatin B into mice. They compared the cells ability to grow and develop in the bone marrow with acute myeloid cells that had not been exposed. Not only did the avocatin B compound kill off AML cancer cells, it was able to do so without having any noteworthy effect at all on normal blood cells—something that standard chemotherapy treatments cannot boast at all. This means that one simple compound from the pit of the avocado could kill cancer cells without negatively impacting a patient’s quality of life the way traditional treatments do. What Could the Research Mean? The study has identified a compound that may lead to a new drug for treating AML, and while there is still a long way to go, it’s incredible to think that this one part of the avocado—a part often tossed in the trash without a second thought by many avocado-loving, health-conscious people—could hold the key to treating AML without harsh side effects, open the door to better quality of life and better survival outcomes for AML patients. Dr. Paul Spagnuolo, who spearheaded the research project, has applied for a patent in the hopes of using avocatin B in a forthcoming cancer-fighting drug that could change the face of AML treatment forever, if effective in vivo. Being a major combatant against an often-deadly form of cancer is impressive enough, but did you know that avocado seeds can help your health in other ways too? The antioxidants contained within the avocado seed can help lower blood cholesterol and blood pressure, keep diabetes at bay, and boost the body’s natural immune response. A study by the National University of Singapore published in Food Chemistry on December 2004 concluded that avocado seed has an even greater level of antioxidant activity than the more commonly eaten parts of the fruit, and the seeds may contain more than 70% of the antioxidants found in the entire fruit. The antioxidants in avocado pits can help reduce inflammation, which can help to heal joint pain and keep other inflammatory conditions in check. A research done by Pennsylvania State University and published in Current Pharmaceutical Design on 2013 the phenolic antioxidant compounds in the seeds may lower high cholesterol, high blood pressure, diabetes and reduce inflammatory conditions. The research also found that the seeds have insecticidal, fungicidal, and anti-microbial properties. Avocado seed has a very high content of soluble fiber which is important for digestive health as well as to heart disease patients as it helps lower cholesterol levels. High fiber diet is one of the best ways to prevent constipation. Avocado seed is very high in potassium which has a great importance for our body (read more about this mineral in my article about potassium deficiency – causes, symptoms and what to do). The level of potassium declines as the fruit matures and is higher when the avocado is not yet ripe. Because of the high “good fat” content of the avocado and its pit (as well as he high fiber content mentioned above), consuming avocado seeds can help you feel more full, paving the way to lose body fat without having to sacrifice the feeling of satiety as with so many diets. Adding an avocado—seed included—per day can help keep the cravings away. It’s no wonder many people look at the avocado pit and balk about eating it: it’s large, and it’s hard. But splitting it open with a good butcher knife and chopping it into smaller chunks, you can get your avocado seed ready to be blended into any smoothie of your choice. It is virtually tasteless when blended with stronger-flavored fruits and veggies, but packed with nutrients that offer healing for your whole body. Make sure to use a super strong and heavy duty food processor for blending the avocado seed. Some people dry out the seed by leaving it in the sunlight on the windowsill and make a powder, while others grate the seed so they can add to sauces or as a seasoning over food. You can also purchase avocado seed powder (like this one) at your local health food store or online. Eating avocado and using the seed is also one of the 70 habits featured in my e-book 70 Powerful Habits For A Great Health which will guide you how to take positive steps to improve your wellness and overall health. You’ve got nothing to lose, so grind up an avocado seed as part of your healthy and natural diet!